How can you easily move on from a dream that came true but was taken away only after a few minutes? You can't. For Miss Colombia, Ariadna Gutierrez, who is being called by many as the shortest-reigning Miss Universe, even tears and an outburst on social media aren't enough. Five hours after she was stripped off the Miss Universe crown after an announcement error, the 20-year old Colombian beauty told her more than half a million followers on Instagram that she will forever be the Miss Universe. Is this her way of protest? Her followers gave their support. Instagram user @xioo_ramirez said that all of Colombia and the latinos are proud of the model who was eventually the First Runner-up. Meanwhile, @erikapla241.et said that Ariadna doesn't need a crown or flowers to be a beauty queen. "You were born to be (a) Queen and grew up to be the most beautiful in the world..."
Filipino fans, on the other hand, called out the post as "disrespectful" of the process, to the real winner, and to the rest of the country the winner represented. 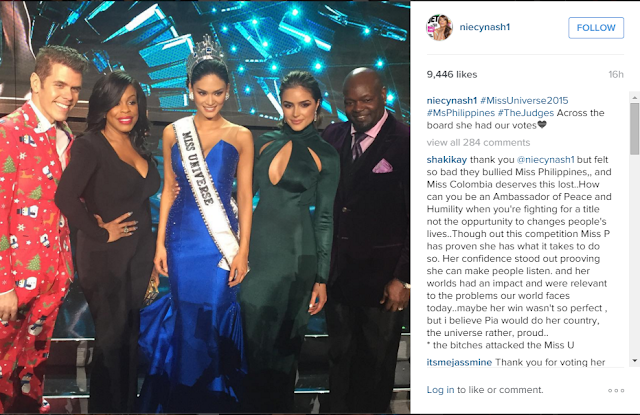 Instagrammer @bernardoedelyn said that the post "was just insulting for all Filipinos and also Miss Philippines." Some were neutral somehow. Filipino IG user @imdrcute apologized. "We feel sorry. But I think no one is to blame here. It's beyond our control. After all you are still confidently beautiful. Should it be you or miss PH, it doesn't matter. You are both deserving!" That post wasn't enough for Gutierrez. Another 5 hours later, she posted a photo on Instagram, showing her waiving to the crowd while wearing the Miss Universe crown. 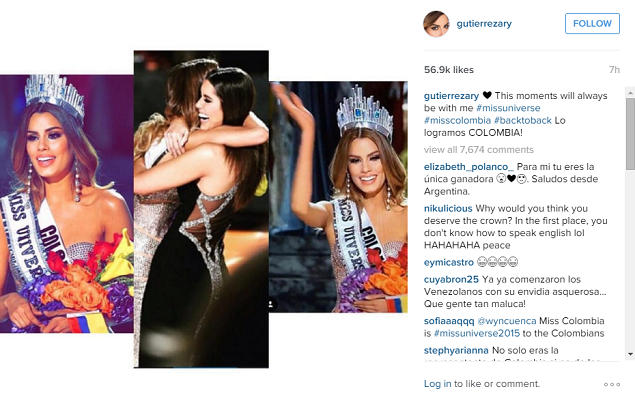 This was edited with another photo of her hugging the outgoing Miss Universe and countrywoman Paulina Vega. Captioned in English "This (These) moments will always be with me." The most intriguing hash tag however is #BackToBack, referring to their country's almost successive wins. Colombians got their second Miss Universe only last year when Paulina Vega won the pageant in Doral, Miami. Her title came 56 years after they won their first Miss Universe crown with Luz Zaluaga in 1958. Yesterday, Colombia was poised for a back-to-back title after Ariadna competed very well at the coronation night where she ended in the Final 3 with Miss Philippines, Pia Wurtzbach and Miss USA ,Olivia Jordan. After the second round of Q&A, Ariadna was erroneously proclaimed Miss Universe. Paulina ran on stage and hugged her. The usual crowning ceremony was completed only to see the results reversed just 4 minutes later. Host Steve Harvey then took responsibility of the fiasco, saying he misread the cue card. Paulina went back on stage to crown Miss Philippines. 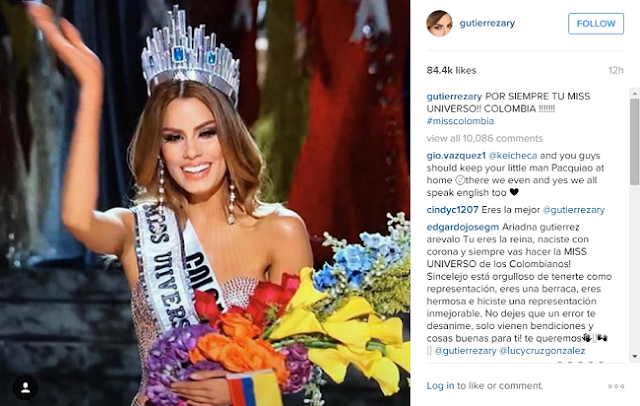 Despite what happened, Miss Colombia still proclaimed on Instagram that her country was successful in making the successive win. "Lo Logramos Colombia!" she wrote which translates to "We did it COLOMBIA!" Obviously, the error wasn't about unfair judging, or a mistake in the calculations of the scores. Scream Queens star Niecy Nash, who sat down as one of the four judges, posted on her Instagram that Miss Philippines has their votes "across the board". Pia also won the online voting which was considered the 5th judge. What then is Miss Colombia celebrating about? It's true that it was a hugely embarrassing situation to be in and it could have shaken up all the bitterness from her veins. However, so much is expected from a flag bearer and a beauty queen of her caliber. A sophisticated acceptance could've lifted her up from that cursed situation. Putting herself to more embarrassment by staying on stage to cry and collect sympathy, and then posting these Instagrams will only make us realize that it was right to make her a non-winner after all. She has the makings of a drama queen, not a beauty queen.